AnonD-1825, 04 Aug 2014http://youtu.be/UHNvs4owJp0 WOW this iOS8 is superfast and supersmooth.And that's on iPhone 5. iPhone 6 is gonna be screaming fast. Same size as stock Android and not the 700mb Android OEMs usually release. Good thing everyone can enjoy stock iOS. iOS 8 looks very promising. A clean and optimized modern OS. http://youtu.be/UHNvs4owJp0 WOW this iOS8 is superfast and supersmooth. Anonymous, 04 Aug 2014too laggy.Huh? What are you running this on? Or are you just trolling? Anonymous, 04 Aug 2014too laggy.Nothing like a well thought out sensible comment! 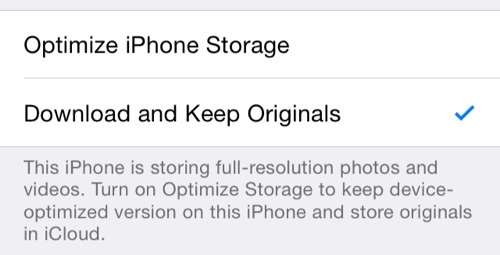 "There's also an iCloud Photo Settings option to store full resolution photos solely in iCloud while keeping device-optimized versions available on the iPhone to save storage space. " This sounds great, i like to store videos and photos inside my iPhone which i took, but those takes lot of space, so interesting to see what that device optimized means in storage size.